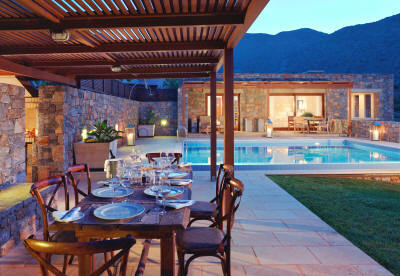 The three two-storey, two bedroom Villas at the Blue Palace impress even the most demanding traveler. The villas are designed to function as private residences and to ensure discretion and absolute privacy in an elegant atmosphere. They are located within the resort premises and they present the ideal choice for guests that wish to combine stylish vacation with privacy and facilities and services of the resort. Villa Almyra and Thalassa are inspired by the Oriental Mediterranean style, while the Grand Villa is by far the most luxurious accommodation with its unpretentious elegance combining elements from Ancient Greece and the warm welcoming colors of the more recent history of Crete. Get inspired by their relaxing elegant theme and choose to spend your holidays in style. Villa Almyra 110 m² consists of two bedrooms with en-suite deluxe bathroom facilities, comfortable sitting area and an infinity swimming pool of 28 m² that can be heated during colder months. The Villa Almyra is designed to ideally combine indoor and outdoor living, with a beautiful terrace overlooking the sea, a pebble mosaic veranda with an outdoor dinning area and sundeck around the pool. Its impressive Main bedroom is located on the first floor and features a super king size, four poster bed adjustable with remote control Through a walk-in dressing area, one goes to the luxurious marble-lined bathroom with separate WC and shower cabinets and a Jacuzzi with sea view. The Main Bedroom is equipped with Sony TV 32'' and DVD, a small office space and mini bar cabinet stocked with premium brands. On the ground floor the second bedroom has a super king size bed, a walk-in dressing area and a marble lined bathroom with Jacuzzi and separate WC and shower cabins. The villa Thalassa is located in the same neighborhood and designed with the same blue colors and influenced as Villa Almyra. 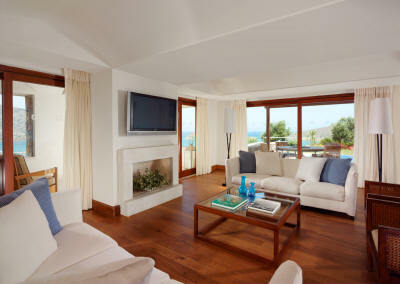 As you enter this villa you find yourself in a spacious living room with a cozy fireplace and a large eastern divan. Thalassa features two bedrooms with spacious en-suite marble lined bathrooms, a living room area with guests bathroom and a beautiful veranda leading to a heated infinity swimming pool of 31 sq. meters. The master bedroom features a super king size bed adjustable by remote control, a cozy fireplace for the colder months and a spacious wardrobe leading to the large and luxurious bathroom with Jacuzzi and sea view. Its large terrace offers spectacular views for long lazy breakfasts. 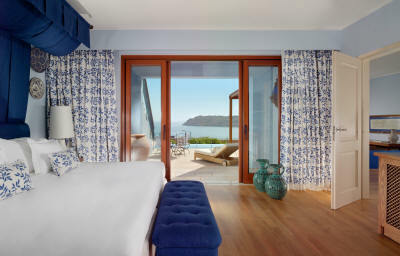 The second Bedroom with an open space marble bathroom, leads to a beautiful covered veranda that overlooks the sea. Both bedrooms are equipped with Sony KV 32'' TV, while the master bedroom has also a DVD. Close the gate to the grand Villa 220 m² and escape into your private world of luxury and elegance. This Villa, with earthly bright colors and large Cretan pots, welcomes you to its spacious rooms overlooking a charming patio with pebble mosaic, from where you can enjoy a relaxing area ideally combining in-door and out-door living. The Villa consists of an elegant living room with fireplace, two luxurious bedrooms with en-suite, marble-lined bathrooms with separate shower and toilet cabinets and 2 Jacuzzis. Its impressive outdoor space is created in a way that ensures absolute privacy and an uncompromised view of the sparkling sea and the isle of Spinalonga. A dining area and comfortable sitting areas are placed around the heated swimming pool 31 m² with two hydro massage seats. A secluded space features an in-door heated swimming pool 18 m² with sea view, sauna and a private massage area. The impressive Grand Villa is designed to offer the most relaxing and enjoyable time for its guests. Home Theater facilities with Plasma 32' TV and DVD, Private garage, and Fireplace in the living room and the master bedroom are some of the 'details' that will make your stay most enjoyable. The luxurious master bedroom is located on the upper floor to ensure more privacy and is very unique in its design. A large open space consists of the bedroom area, the spacious dressing area, the luxurious bathroom with wooden floor and a Jacuzzi with sea view. The second bedroom is located on the ground floor right by the pool. Both, the master and the second bedroom, are elegantly appointed with super king size beds and 32' TVs. The master bedroom also features a DVD and a remote control adjustable bed. A rare service can be provided if guests decide to have a private dinner or function in the Grand Villa. The Royal Blue Villa is an attribute to ultimate luxe with state of the art features. A private Residence with its own entrance, this villa enjoys a unique location with spectacular views to the Mediterranean Sea. All rooms are individually decorated with handpicked furniture to reflect individual eclectic style and subdued sophistication. Total indoor size of 290 m2/3.121 ft2 including a stylish living room with fireplace overlooking the Sea and separate dining area; three luxurious bedrooms with king size beds; Spacious his & hers dressing areas; Three luxurious en-suite marble bathrooms with separate toilet, rain shower cabinets and Jacuzzi bathtubs; Impressive outdoor patio leading to a private garden, ensuring absolute privacy and offering uncompromised views to the sea; Outdoor dining area with barbecue facilities and sitting and dining areas are placed around the pool;Heated Infinity Pool of 35 sq. m. Sunbeds by the Pool;Outdoor barbeque facilities; Separate entrance for service and butler;small kitchen-service area. In room entertainment system featuring one 32'' LCD TV in each bedroom with multilingual satellite channels and pay-per-view prime selection movies; one 42'' Plasma TV in living room with Home Theatre facilities. CD/ DVD, Satellite Channels and pay-per-view movies; One 13'' LCD TV set in each of the bathrooms. Nintendo and I-pod / Mp3 Player, Full Audio System. Five multi-line direct-dial telephones with voice mail and Wi-Fi Internet accessibility. Bedside control panel with "Privacy" and "Please Make Up My Room" buttons.